Like so many of the nation’s working waterfronts, Detroit’s has suffered the effects of neglect. As one of the City’s most underutilized assets, the Detroit River is now being transformed into an attractive and lively destination. Intermittent sections of the riverfront area, beginning at the south side of Joe Louis Arena and extending eastward approximately 3 miles to the north end of Gabriel Richard Park (east of the MacArthur Bridge to Belle Isle) will be connected to existing portions of the Riverwalk and other riverfront parks. A 20-foot wide pedestrian walkway/bike path on a 60-foot wide easement is planned as part of the riverfront project. 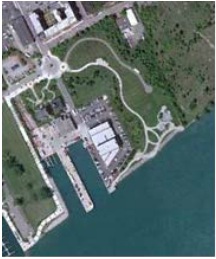 Other design improvements planned for these areas will include gathering places, security/phone systems, a pavilion area with a tensile fabric structure, and improvements to the existing seawall along the Detroit River. Additionally, a pedestrian bridge with a pedestrian walkway and a bicycle path is planned over an existing, unused boat slip. NTH was teamed with The Mannik & Smith Group to provide geotechnical, seawall and regulatory compliance services, as well as support associated with for environmental and utility services. Field investigations were performed for structures including pedestrian bridge, paths and pavilion. More than 80 borings were drilled, and field investigations were performed on aggressive schedules, and required significant coordination with City organizations and the U.S. Coast. Another geotechnical challenge to this project was the nature of the urban soils with previous foundation remnants and uncontrolled fill soils. Laboratory testing was performed in our southeast Michigan laboratory facilities. Seawall assessments and evaluations were performed concurrently with the geotechnical investigation. Foundation recommendations consisted of spread footings for the pavilion and deep foundations for the pedestrian bridge were provided using Load and Resistance Factor Design (LRFD) techniques. An evaluation of the seawalls will allow for the reuse and rehabilitation of several sections and provided a value-added solution.